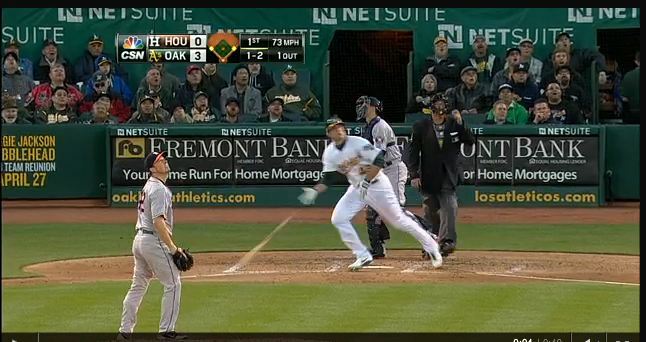 It took Oakland A’s rookie Nate Freiman just 14 MLB at-bats to smash his first home run (see video), a 3-run shot off Houston Astros starter Erik Bedard that landed in the upper-level left-field bleachers before a cheering hometown crowd on Monday (4/15/2013). ESPN’s Home Run Tracker estimated the ball traveled 396 feet. The A’s went on to defeat the Astros in a lopsided 11-2 win. Freiman said hitting the home run was an “amazing feeling” but that the day was “bittersweet,” given the explosions that marred Monday’s running of the Boston Marathon. The 26-year-old first baseman grew up in nearby Wellesley, Mass., where many family members remain. After the 2012 season, Jewish Baseball News named Freiman the top minor-league power hitter. The Astros acquired him in December’s Rule 5 draft, months after the 6-foot-8-inch slugger starred with Team Israel in the World Baseball Classic qualifiers. But when the Astros placed Freiman on waivers in March, Oakland grabbed him. He opened the 2013 season on the A’s roster but has seen limited action, serving Monday as designated hitter. Interestingly, the A’s are 6-1 in games where Freiman has played, and 4-3 otherwise. Freiman’s homer off former teammate Bedard came on a 1-2 count. After seeing three fastballs, he crushed the next pitch, a 73 mph curveball. Security persuaded a fan to give up the home-run ball in exchange for one signed by Freiman (see video). Oakland is scheduled to play Houston again tonight (4/16/2013) at 10:05 pm ET.